Having a cat with a taste for houseplants can not only be frustrating; it can be hazardous to the health of your cat as well. 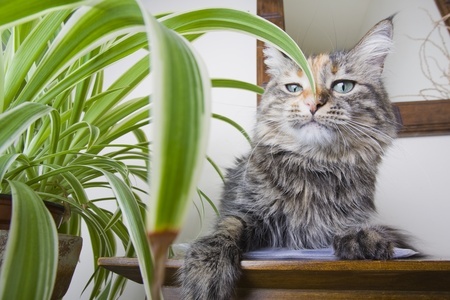 Many common houseplants are toxic to cats, including snake plants, aloe vera and jade plants. These toxic plants should always be kept away from hungry kitties, but there are steps you can take to discourage your cat from munching on the rest of your houseplants as well. There are several ways you can make house plants seem less appetizing to your feline companion. Cats typically don’t like the smell of citrus, so you can start by laying orange and lemon peels in the soil of potted plants. Sprinkling a little cayenne pepper around the leaves of your houseplants can make cats think twice about eating them, too. If your cat likes to use potted plants as a litter box, consider covering the soil with a layer of large, smooth pebbles and stones. This texture will make the plants seem far less appealing to most cats. In addition to cat-proofing your existing plants, you can also grow plants that cats are predisposed to dislike. Rosemary is a great option to consider, because cats don’t like the smell of this aromatic herb and you can use it in your kitchen. Cats also tend to avoid thorny plants like roses and cacti. If you just can’t seem to keep a curious cat away from your plants, you may just have to move them to a place that your cat can’t access. You could even treat this as an opportunity to create a lush indoor greenhouse in a room that gets plenty of light. You may also be able to hang potted plants to keep them out of reach of your cat as well.